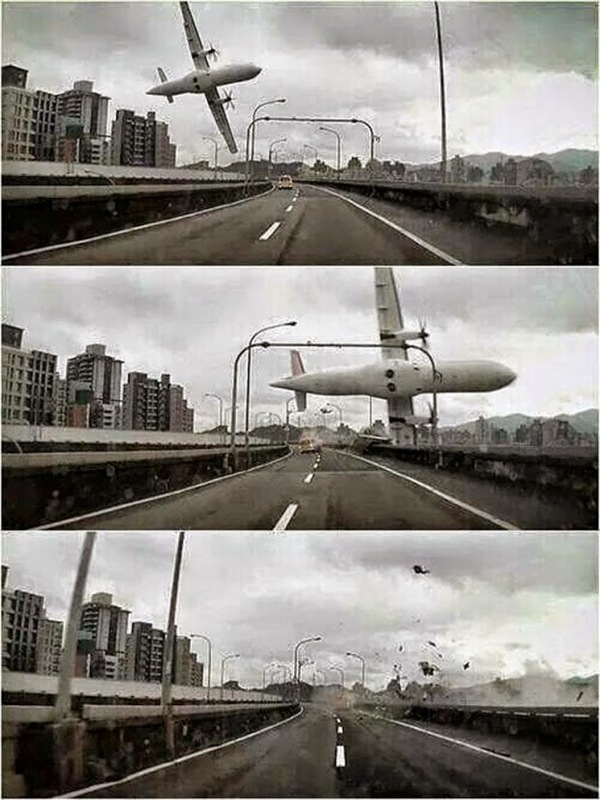 By now everyone has seen these dramatic images of the TransAsia ATR 72 that crashed into a river shortly after takeoff from Taipei. 15 of 58 passengers aboard survived the crash but neither pilot survived. The data recorders have been recovered and are being analyzed. So far it is known that the aircraft reported engine problems at an altitude of 1200ft, 37 seconds into the flight. One of the pilots radioed the word "flameout" shortly before the crash and apparently an automated maintenance reporting system also sent a signal indicating that one of the engines had suffered a flameout according to an aviation investigator. The term "flameout" is used by pilots to indicate that an engine has stopped producing thrust. While the ATR 72 is a propeller driven aircraft, its engines are technically known as turboprops. This type of engine is actually a turbine, or jet engine attached to a propeller. This means that if fuel is interrupted or some other malfunction occurs, the "flame" in the hot combustion section can go "out", and the engine stops producing thrust. This particular ATR 72 was relatively new having been delivered in April but had suffered engine problems previously. The malfunctioning engine had been replaced according to reports. News reports did not mention which engine that was. The latest reports now indicate that the right engine had not flamed out but had inadvertently entered "auto-feather" mode meaning that the propeller blades themselves are rotated on their axis so as to stop producing thrust but that the engine itself continued to run. This was apparently an uncommanded anomaly which would present itself to the pilots in the same fashion as a flameout. Furthermore, the data recorders also indicate that the left engine was manually shut down. This suggests that there was confusion in the cockpit as to which engine had suffered a loss of thrust and the wrong engine may have been chosen to attempt a restart. There was a time in aviation when things would routinely go wrong. Engines were unreliable, instruments were rudimentary and inaccurate, and pilots were pretty much on their own. Those days are decades gone and modern commercial transports almost never suffer the catastrophic failures of the past but that doesn't mean bad things don't happen. They still occasionally do, but the odds of say an engine failure on takeoff, one of the most challenging things that can happen, are becoming vanishingly small. At the current reliability rates of aircraft engines, the expected statistical occurrence of any engine failure let alone one at takeoff over a career of flying, is in the low single digits. This is a really good thing, but it does present the problem of how to keep pilots from becoming complacent. Luckily, modern day simulators have capabilities that are so true in fidelity to actual aircraft that the FAA allows new pilots to complete a full training program and check ride entirely in a simulator. The first time a pilot may fly a newly assigned aircraft is now routinely on a revenue flight with paying passengers. The sims are that good. Not only do all pilots train for normal operations in the sim, but we are routinely checked on emergency procedures such as engine and other system failures. One of the most common (and nerve wracking) events is known as the "V1 cut". In this scenario, during takeoff the instructor will fail an engine almost immediately after reaching our go/no-go decision speed known as V1. This is the most critical point to lose an engine as you are committed to take off but have barely any flying speed. You won't know which engine will fail or how but you have an idea that something bad is going to happen. You're in the sim after all, and it's a required item, so it's coming. Not so true during everyday flying. When the engine fails, the first thing you notice is that the aircraft will yaw, meaning the nose will swing towards the failed engine. (The thrust from your good engine on the other side is now pushing the nose towards the failed one.) What must be immediately done then is to apply rudder to realign the aircraft with the runway so you don't go off the side into the grass. This is also your best clue as to which engine has failed without even looking at the gauges. It's an instinctual response. The nose goes left, you step on the right rudder. If you're already airborne when the engine fails, the best indicator of which engine failed will more likely be the instruments, especially at night. I always instructed my students to "step on the good engine" and it seemed to work for them. I should probably also mention now that while an engine failure on takeoff is a serious event, it is also an eminently survivable one. All commercial transport aircraft are designed to fly perfectly well with the loss of an engine. Back in my military days, we'd fail two engines on one side of a four engine plane and get it to the runway with no fuss. In fact with no other system malfunctions, a single engine airliner won't fly as high or fast with a failed engine but landing is not a particular challenge. The procedures to be followed after getting airborne and cleaned up with a failed engine are to determine what went wrong, attempt a restart of the failed engine if warranted, and to plan a return to the departure airport. Under certain conditions such as no apparent fire, and no internal damage or seizure, a restart may be attempted. If a restart is not warranted due perhaps to a seized rotor, the engine should be secured. Here is where mischief can occur. Checklists for both an emergency restart and also for securing a failed engine both usually involve taking the fuel control to off. For a restart attempt, this resets the fuel control unit and for a shutdown, you don't want fuel flowing into the dead engine. You have two engines with two fuel control levers right next to one another. This is the time to be very careful to choose the correct one. Choose unwisely and you're a glider. At my airline, as I suspect at most, this is a two person job with one person designated to guard the good engine lever while the other person shuts down the failed engine. Again the key to all of this is to not rush. A single engine airplane will fly just fine all day, so rushing will only increase the likelihood of mistakes. There is actually precedent for the shutting down of a wrong engine causing a crash. In 1989 a British Midland Boeing 737-400 crashed when the pilots shut down a good engine having misidentified which engine had suffered an internal failure. There were 47 fatalities. As I mentioned above, things almost never go wrong in commercial aviation, but when they do, you will be presented with multiple alarms sounding and a profound sense of confusion as you attempt to figure out what just happened. Simulator training is invaluable to be prepared but nothing tops a mental preparation to always expect the worst. One of my fellow USAF instructors used to say: "Maybe step one of emergency procedures ought to be...Wind the clock. Might stop pilots from making a bad situation worse.